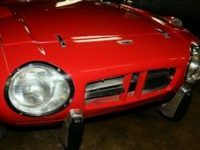 With the introduction this week of the Toyota S-FR concept, and the recent return of the original Honda ’60s S500/600/800 production cars as the new Honda S660, it’s only fitting that we take a look at Toyota’s original late ’60s small sports car, the Toyota Sports 800. The Sports 800 was a very small 140″ rear wheel drive sports car with a removable aluminum targa top and fixed hoop and back window roof. With a .76 liter engine, air-cooled, 2 cylinder boxer engine and 45 PS horsepower, it wasn’t going to set the roads ablaze despite a 1300 pound curb weight and a top speed of perhaps 95 MPH. But it compared very favorably to the Honda S series, which took 3 iterations to get from a .5 liter engine to a .8 liter size. The Toyota Sports 800 was produced from 1965 thru 1969, and 3120 were built. Of that, 41 were built in left-hand drive form as the start of an intended export program to the United States. However, when the nascent Toyota dealer network of the time was shown the cars, they rejected them as too small for the market. Instead of taking the 41 cars back to Japan, they were simply sold off here. That failure, and the emissions characteristics of the air-cooled engine, probably sealed the doom for the Sports 800. Very few cars remain today, but there is a strong owner and enthusiast base. We were very fortunate to encounter this 1967 example at the Lane Motor Museum in Nashville TN. The Lane Museum is in our opinion the most approachable car museum in the country – their cars are right out in the open where enthusiasts can get close and see all the interesting details. We’ve see this Sports 800 at the Lane several times over the past years. It’s licensed and driven regularly, and that is the philosophy of the Lane museum. It’s only fitting that this worthwhile survivor be driven as it was originally intended! Enjoy our gallery, and be sure to visit the Lane museum if you are in the area.